Hello from the rain battered Midlands. I realised yesterday that it's been a while since my last post, but I hope this makes up for it as today is a double barelled one- an outfit and some more of my sketches. First up are some photos from yesterday. The weather has been completely miserable and wet all week here in the UK so I had to resort to doing a shoot indoors instead. Or in this case, in front of the fire. I wanted a cosy atmosphere as it was so horrible outside. The dress is an American Apparel one (already seen on my blog in a different incarnation a long time ago) which I was given in a charity shop for free. It still had the original price tag on, and I was told I could have it for nothing as it was only fit for a halloween costume- how wrong they were! But this assumption worked out very well for me. The cardigan is another charity shop item, and is the cosiest thing known to man (well, woman in this case.) The vintage belt was given to me by my paternal grandma which she wore in the eighties- thanks Babi! Both the hats are vintage. One is thrifted and the other was my maternal great-grandmother's. The brown lace ups were found by my mum in a charity shop. They are sadly too small to go out for a proper long walk in but are fine when I'm just lounging around. Silk scarves and gloves seen in shots are all family items and the vintage vogue is one from my collection. And on to the second part of this post. Autumn has now officially been washed away in a torrential flood, so I thought it would be an appropriate time to post these sketches. I was so inspired by the glorious colours and images of autumn this year that I had to somehow translate these into designs. I also took a lot of photos, but more on that another time.. I think this one pretty much explains itself. 'Little Red Riding Hood.' What else is there to say? This one is a cable knit grey jumper dress (with knitting needles in her bun to match.) I wanted it to look cosy and quirky. The thought behind this was a bundle of twigs tied together with twine. You could call it 'The Twiggy'! Just generally a warm comfortable dress to wear, paying attention to the detail- such as the pockets with visible stitching and the orange socks peeping out of the boots. You can't have inspiration from autumn without thinking about fire. I think its sometime just as interesting to concentrate on the back of the dress as the front. I couldn't resist finishing this off with a chimney top hat complete with complimentary smoke! Whimsical is my word du jour here. Autumn leaves- another one that pretty much doesn't need explanation. 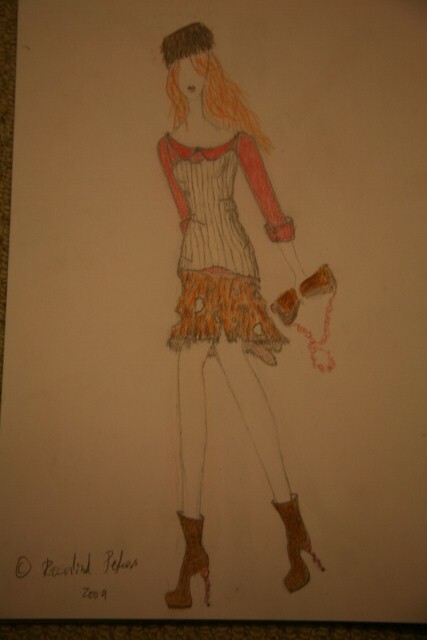 This is acually based on and idea I had for a dress when I was about 11, you could call this the updated version. Berry red corset over a crumpled silk grey dress. Layering of a slightly different style! One of the reasons I love living in the countryside is all the greenery (or orangery and red-y depending on the time of year obviously.) Trees are so beautiful all year round. Again I wanted to concentrate on the back. 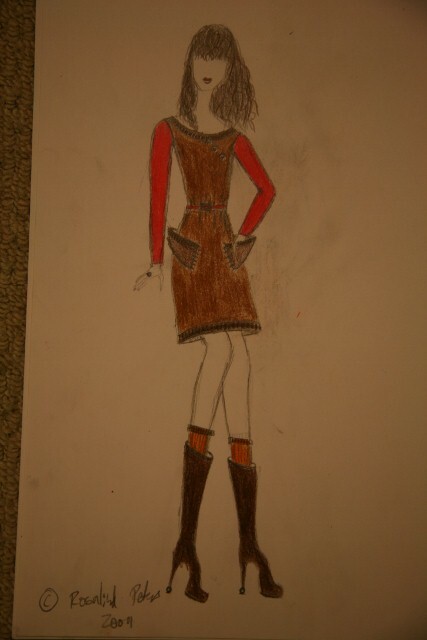 The skirt was inspired by the rust and decay that comes naturally with autumn- the season of change. The cream layered top is a thermal vest over a red silk shirt- underwear as outerwear. And the hat is brown faux fur. 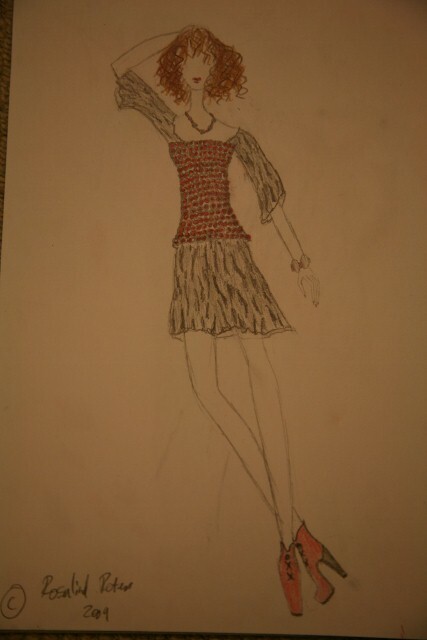 I started and gave up on this design about 3 times. 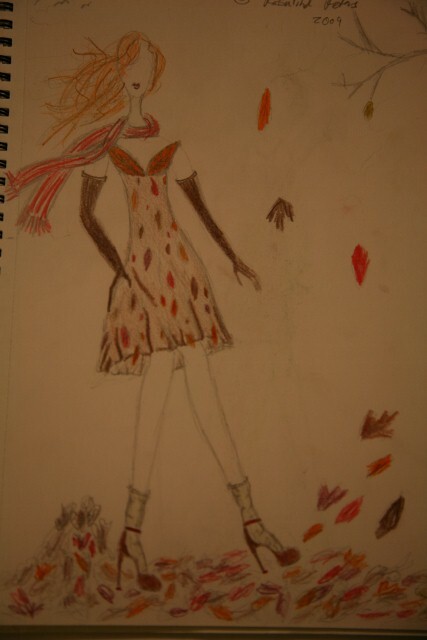 I had the idea of a 'skeleton leaf coat' in my head but that was about it. In the end I had this idea when I looked up to see my vintage tailcoat hanging on my wardrobe door. This skeleton leaf translucent coat is part bed jacket, evening coat and tail coat. The headress was an idea taken from a plant I saw walking home after school one day last week. I would have posted these yesterday but it's been another really busy weekend and my house has been in complete and utter chaos! 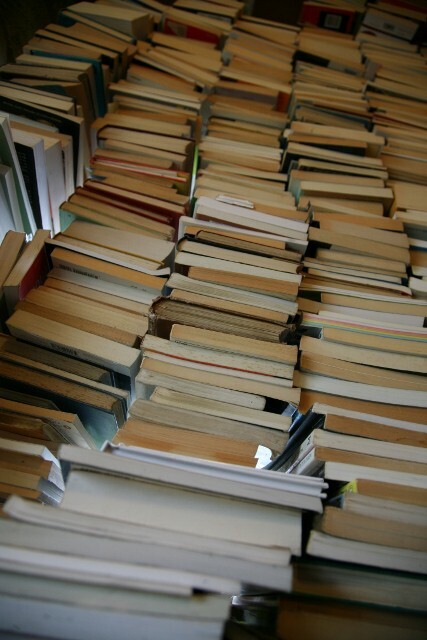 Our landing is about to be redecorated which means that about 1000 books (quite literally) have had to be removed from various shelves and are now sitting around in precariously balanced wobbly piles on the floor and sundry windowsills. An example is shown above. One last thing to say is a massive thank you- I now have over 200 followers! This really means so much to me, thanks to every single one of you. Ooops, this is definitely the longest post I've ever done. Congratulations to anyone who's waded through the waffle to the end. Those photos are gorgeous! I love the warm and cozy setting. Your designs are also really cool and different, especially "The Twiggy"! I absolutely adore all of your designs. Sweet designs! 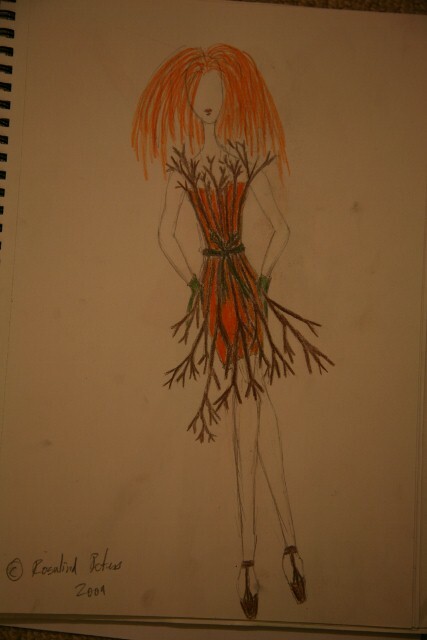 I especially like the berry corset over gray dress, the full-length tree back dress, and skeleton leaf cardi. I used to sketch designs when I was around your age- mine were nowhere near as creative as yours, though. Great photo shoot of your outfit! It does appear so warm and cozy, and the light is quite golden, soft and autumnal. I adore your hat, you are so pretty! As for your designs, the first one is my favourite. 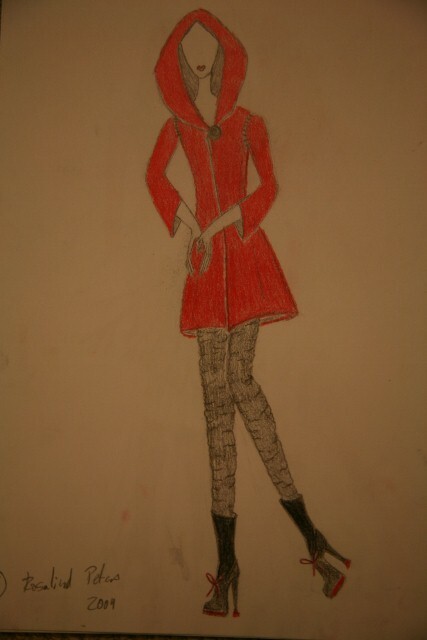 I want a red coat like that so badly. And then I love the boots on the second last one. Absolutely stunning, you are! I love the drawings, they are individually unique and beautiful. Beautiful drawings & designs (& congratulations on reaching the 200 followers mark!). I was thinking about you this weekend, watching about Cockermouth with concern & wondering how it was in your part of England. 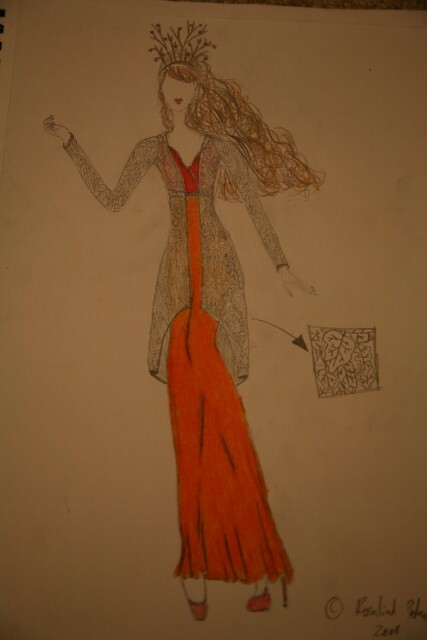 I can't get over your talent, these designs are absolutely inspired. 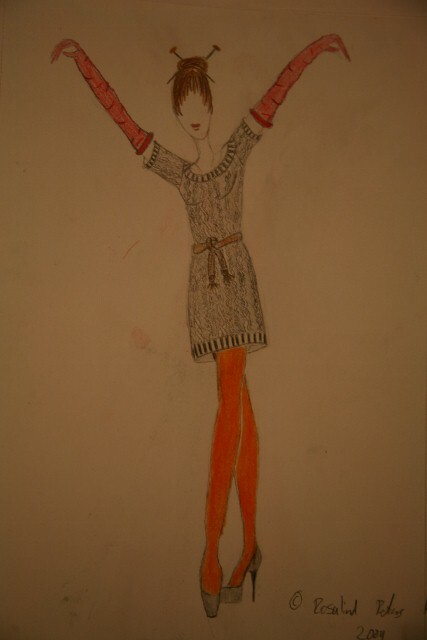 I think my favourite is the 'decay' rust skirt with underwear as outerwear thermal over silk. Altho they're all brilliant. You're really THINKING about fashion, and the world around you. And gorgeous shots by the fire, and once again, it's the personal references, and history of the pieces, looked at in a new light. Have been thinking of a new debate for you, and might even try to start it on my own blog: what do you think of Kate Moss's recent comment? As a 14 year old, would it inspire you to become anorexic? She also said some wonderful things in the original online interview, including a paragraph about how if you're a nice person you will look beautiful (as you do) and someone that seems 'beautiful' but isn't nice won't look beautiful for long (or something like that). But That quote got all the attention. And I'm curious what younger women & girls feel about it, and her. awesome pictures!!! at first i thought they were from a magazine photoshoot! 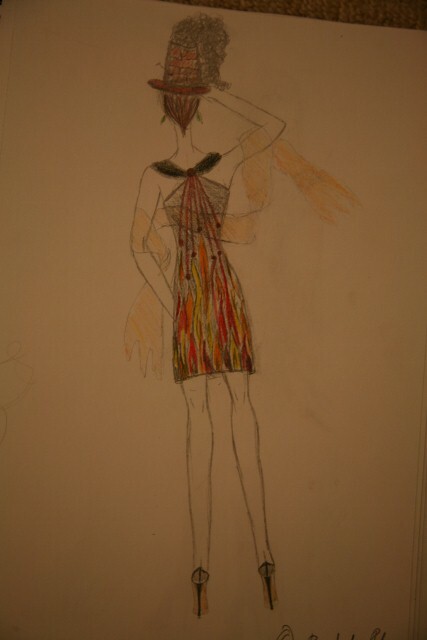 the clothes designs are really imaginative and original! wow! I'm so glad I followed you to see such a great post like this. Your designs are brill. I would never think to have an idea like that. C'est Super moi amie. I'll take a twiggy, and a berry corset! 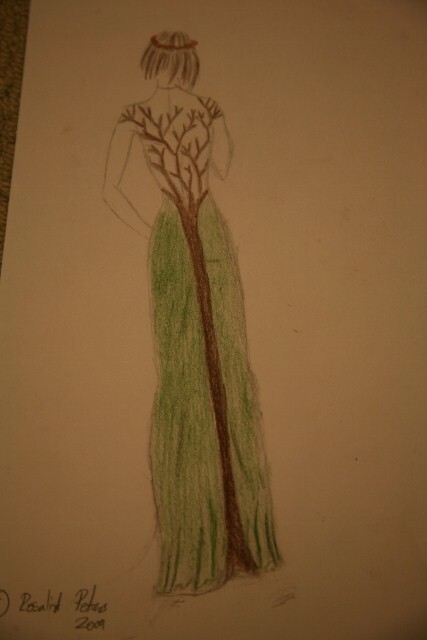 The tree dress and leaf sketon coat are especially outstanding. Really love the detail you've put into the designs, I can just see them on a forest path catwalk. As always love the photos too! I love all your photos; you're photoshoots are ones that I'm definitely envious of! you look so amazing in the fashion shoot! I totally loved your illustrations. "the twiggy" was one my favs. Great job! I'm absolutely in love with your outfit. Girl you've got great style! i really like no°1 & no°3. CIAO, LOVE YOUR BLOG, SPECIALLY THE LAST POSTS.. :-) I'M FOLLOWING YOU, FOLLOW ME TOO! Well, my favorite is the berry corset over the grey dress. I love grey and berry colors and the layering idea is great. Your pictures are lovely as usual:) You definitely have great style It is apparent by the photos and styling. Those drawings are amazing as well. You are incredibly talented. Your designs really should be turned into outfits. I love them all and would totally buy them! You are absolutely gorgeous, and I am kind of in love with your shoes. 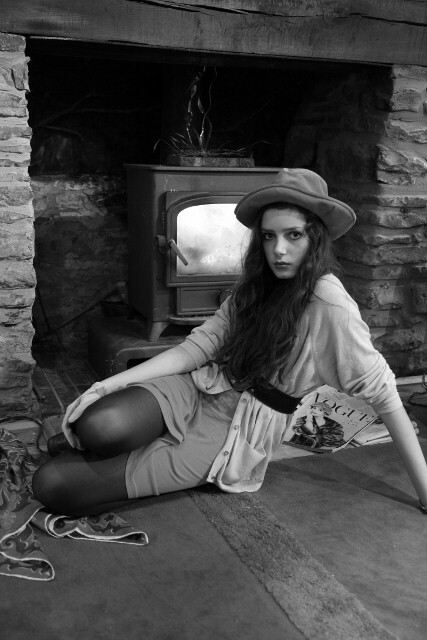 Your photography is gorgeous, as always: i like the balance here between the temperature of the room and your nostalgic pose- it's cosy and claustrophobic, warm and garish, all at once. Omg i love the hats!!!!!!!!!! Your pictures always have something about them that is absorbing and fresh (? )but also antique-ish as well if you know what i mean. Lol i'm not sure what i'm trying to say here but your style and the photoshoot totally suits that Autumny 'changing' feeling. these are all so good!!! Since I commented on how lovely your drawings are, I'll go ahead and say that I adore your outfit. Because I do. I'm so envious of all your beautiful photos, and that hat is so fuzzy and adorable.